Hi, just thought you might like to check out my second previz ever, It was done about 10mths ago. I’d approach the whole thing quite differently now! Still it’s not bad! I’ve posted a comparison page for the “Looking Back” clip which has recieved some great feedback! Check out the “Looking Back”clip. Hi, today I went through the ‘Looking Back’ project files and saved out some stills so I could share some behind the scenes stuff. So here goes, the first shows how the swap out the heads trick worked. The central character needed to be ‘with child’ and I needed a solution which was purely Antics. 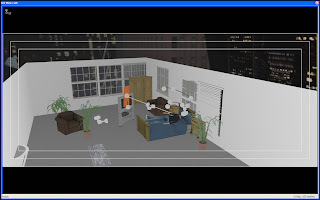 As with all the 3d content, the whole clip is from Antics library of characters and props. A sphere for a tummy and some shading on a jumper shader did the job. The second image is from the graveyard. Again I was looking for an Antics solutions so every cross is made up of two rectangle boxes. They are then placed one by one so that the followed the contour of the ground. The panoramic view is aided by some cool Sky maps I’ve got in addition to the Antics library of sky maps. The sky is mapped onto a sphere, this way it can be rotated to put the sun exactly where you want it. In the final outdoor scene of the clip I animated a rotation on the sky so the clouds looked like they were drifting. The next frame is showing how the path is set for the the camera crane on the baseball field. I draw the path flat on the ground, starting at the end position,(close to the feet) then place points radially out so that the path resembles a snail shell. Then I set the height of each point in a side view. In the shot the boy’s grip on the bat was done in the grasp editor and the hat was attached using an attach command. (which was kinda broke every time the scene reloaded). The amy base scene had some paths in the sky for the f-15 aircraft and some more on the ground for the tanks. The real trick here is that the character’s head also needed swapping but the helmet remained with the body model. The shot got a heavy post treatment so a billboard blue screen was put in once the shot was worked out. To seperate the guy out. Lastly I wanted to demonstrate the lighting of the bedroom scene. The shutters were built using the box primitives, the orange card in the tv is for the inset of some vision, the path around the bed show where the camera travelled. Outside, across the road are some buildings with night shots of a city used as shaders. The shutters are setup to catch some of the lights between the slots. The effect was enhanced with a post treatment to make some light rays. A light on a path gives the tv flicker lighting. That’s it for now. I’ve got a before and after clip here. Or you can check out the final clip here – “Looking Back“. Be sure to bring some tissues! Check out Stefan’s latest work, some great action! I really like the way he did the guy hanging on the back of the tail of the biplane. I also wanted to say a big thanks for the support. lights, shadows, yucky lookats and other stuff. High on my wish list for Antics 3d is the ability to import Poser characters. In the meantime here is a hot tip I’ve just started using. Find two characters of similiar size. Say Girl A and Girl B. If you’d like A’s head on B’s body, then animate B to do whatever you want first. When you are done, use the shaders editor to set the head of B to invisible. Now save out poses of B and get A do follow the same animation. Hide A’s body (leaving the head!) and you’ve got yourself a new character. You could try experiment with link/attach the head to B’s body also. Good Luck! For Stefan who wrote…..Hey Tony, I’m just finishing up on my epic pre-viz. 🙂 As you I’m sure know, It’s in the 14’th hour that things get hairy. I had a bit of frustrating day with “goto” paths getting corrupted by “lookats” in antics. Anyway, I will send you a link to my viz as soon as one exists. I’m excited to share it. – how did you do your desert? A warm welcome to “L.A. Antics 3d meetup group”! This is great. We will definitely push folks to the blog. great camera work and lighting! A cool look can be achieved by hiding certain objects and then choosing “display Hidden objects”. This effect was helped by picking some night shots of the city as texture maps for the buildings. The whole scene is made from library content and took about 1/2 hr. I’ve been using Antics for a little while now. It can be a great tool, the package overall is good. Sometimes the logic is a little unorthodox though. The latest clip “Reality Hacker” is kinda of a showcase of where I’m at with the program. 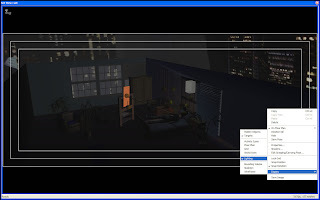 (www.previz.com.au). The clip took advantage of some workflows I’ve solved involving animated texture maps, simulating depth of field, x-ray look, set construction techniques using a photograph and lighting tricks. I’ll post some more explantations and screen shots soon.